A few days ago I was nominated for the Three Quotes/Three Days challenge. I accepted this challenge because I love the idea of taking a step back from blogging and doing something different. I hope you enjoy reading these posts as much as I enjoy writing them. I want to thank Laura at Laura Bruno Lilly: The Journey Continues for nominating me. 1) Thank the person who nominated you — thanks again Laura!! 2) Post a quote each day for three days. 3) Each day nominate three new bloggers to take part. I decided to use quotes from three First Ladies I admire. These women were pillars of strength in their own right. They stood for principles of women’s rights, human rights, and doing the right thing with their time and energy. Each struggled with the challenge of making their own way in the shadow of their husbands, while leaving their personal stamp on history. Would we even know about them without their famous husbands? I’m not sure the answer matters. What each of them was able to accomplish took courage, tremendous strength of character, and persistence in furthering what they believed in despite a lot of pushback from those who wanted to keep them in their place. 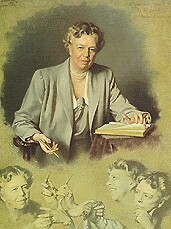 For Day One I have a quote from one of my favorite First Ladies, Eleanor Roosevelt. There were so many good quotes to choose from, it was tough to pick just one. Mrs. Roosevelt persevered in the face of many obstacles, including helping her husband get back into the public sphere after he had polio, making public appearances and being the face of the presidency when FDR could not, and having to make speeches despite being an introvert. She championed causes she cared deeply about, even if her husband or the administration did not. In short, she put herself out there and did things outside her comfort zone. Thank you Laura for allowing me to participate. I like having a question to answer and at the same time think of how to connect it to my blog theme. I can’t wait to see what others do with this.